I had an interesting visitor the other day, Iswish Planner. He's an interesting fellow who is involved in the RL music scene, including having worked with Michael Jackson in the past. His request was whether I made clouds. And I don't. Or at least didn't until then. With Iswish's help, I built a complete set of cloud devices: Small, Medium, Large and Crazy. “Crazy” you ask? It's basically the Large Cloud but instead of having a mixture of naturally-appearing light grey and white colors, like you'd find in a normal cloud, it has random wild flourescent and pastel colors! I was surprised to find that the best seller of the Cloud family is CrazyCloud by a large margin. Why? I don't know! What are people doing with it? I have no idea! Somebody let me know what's going on! I made another cloud variety, specifically for Vampires (pictured). 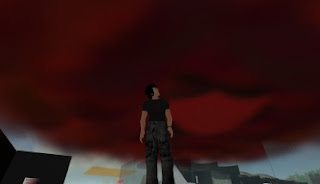 It has blood red and black colored fog, and is very eerie to stand underneath. I think it's quite effective, yet very few are sold. Who would have guessed? This all tells me that at the end of the day, the customers know best. Keep listening to them. Andromeda Klees, one of my friends from France, loves particles, and lots of them. She wanted a really big effect, so I made one: SuperNova. This effect has three stages that simulate an actual star going supernova. At first a 20 meter wide red ball appears around you. Suddenly, the ball collapses towards the center (you). When the collapse is almost complete an enormous amount of white radiation flys away from you in criss-crossing patterns for perhaps a 60 meter diameter! Finally, black and grey debris float away to complete the supernova. SuperNova is now on sale at my shop in Caso Milo – and remember, this is a truly BIG effect, so use it with great caution! My good friend VaaaVa Voom called me the other day (not to be confused with VaVaa Voom or VaaVa Voom). She's been hired as a manager for the Furumachi sim. It's a large Japanese build that has all kinds of things going on it. Anyway, VaaaVa wanted me to set up a satellite shop in their new mall. Oh boy – readers will know my opinion of malls by now! But, as she is a good friend and offered such a good deal, I could not turn it down. So, now I have yet another satellite shop location – and even though Furumachi is not really open yet, this shop actually gets somewhat more traffic per day than my other location in Amat! But that's not the topic of this post. Here's what happened: I met and spoke with another of the mall unit users, Mustang2 Bing. He's a very cool guy who is connected to the RL music industry and is tearing up SL with his enthusiasm and talent. Turns out he was recruited by the Furumachi administration to set up a benefit concert on August 18th in Furumachi to collect L$ for earthquake victims in Japan. I asked Mustang what I could do to help, and he wasn't sure any particles were required, but then said “maybe some fireworks to use between shows”. So, I promptly built some very cool (and large) custom fireworks, which are now ready to be used during the show. As a donator of items, Mustang said I am now an official sponsor and thus have a advertising box on display at the show location. The punch line to all this is that a year ago, I would never have expected to own a thriving virtual business that sells imaginary products to virtual people, and helps sponsor worldwide benefit concerts for the unfortunate in Japan. How can I explain this to my Mom? My friend Kim Junot, a creator of fine dance floors, made a great suggestion this week: “why not start a group?” I agreed that this was a good idea, since there is some evidence that I have “fans” in SL after having visited some clubs and finding many people using my effects. Creating a group is technically simple; The creative aspect is more difficult. What is the name of the group? What are the titles of the officers and members? In the end I decided the best thing to do would be to reinforce my brand, “Electric Pixels”. I believe that in order to make things easier for customers, the name should be easy to remember. By making my group name equal to my brand name, I have taken another small step to building up the brand. Announcements of major events, such as moving locations, temporary closings, etc. I don't think the customers want to know anything else, but I encourage anyone to correct me. To make it easy for customers to join my group, I built a Group Inviter device and planted it in the middle of my shop. It appears as if you simply Touch the device to be joined to the group. The script for this is a little goofy, however. It turns out that Linden Lab's LSL does not include any APIs for interfacing with Groups! So how can you possibly script a Group Inviter? Easy – I fake it by simply having it send me an IM with the name of the requestor. Then I just add them manually. If too many people ask for invites and I cannot keep up, well, I would LIKE to have that problem! 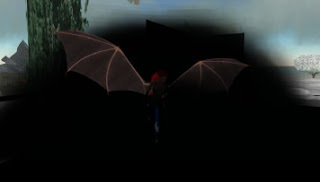 I had an unusual visitor the other day.... Xilow Demina is a demonic slave girl. I've often encountered slaves, but have never spent any significant time with one. I guess the concept is lost on me, but I understand that people can enjoy being a slave, just like any other RP activity. She was looking for something to make darkness, as she said that “demons should be able to create night”. Xilow gave me a lot of help designing this new effect – but it was a little strange working with a slave who kept calling me “Master”. I was required to call her “The Girl”while we collaborated, and give her permission to stand, talk, sit, etc. This is a completely new kind of effect, which basically creates large, completely black particles all around you. It looks like a fog, but it within it you cannot see anything because it is completely black! Only the labels of nearby avatars are visible. The effect lasts for several seconds, so that you could, for example, TP out while the fog is active and when it fades you are long gone! NightFog is now on sale at my shop in Caso Milo.